The Black River is something to be cherished. Guided by reverence for this unspoiled land, Harbor Club South Haven strives to honor nature’s enduring character without sacrificing luxury and open space. This philosophy is what makes this ecologically-sound southwest Michigan waterfront development a clear and popular choice for those seeking premium South Haven, Michigan real estate. 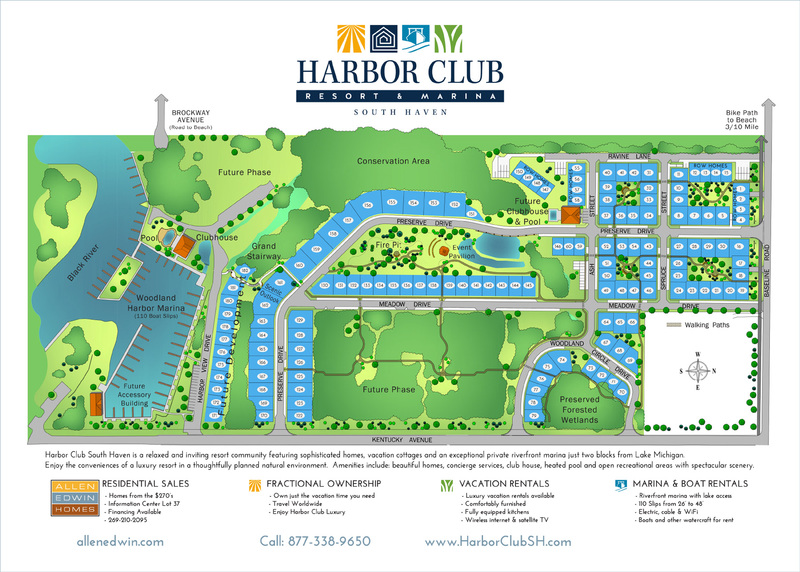 Harbor Club is a 40-acre riverfront development that offers an expansive landscape for year-round play and renewal. A vibrant, walkable neighborhood by design, its minimized roadways and limited interior traffic offer shelter and peace of mind. Miles of walkways, including a wooded nature trail, stretch in all directions – from the river bank to the beach, through the meadows and ravines of the amazing landscapes of southwest Michigan. If you love the open water, the private 110-slip marina at Harbor Club is a welcome amenity in southwestern Michigan. It is truly one of the most beautiful marinas in the Lake Michigan shore resort area. Two-thirds of Harbor Club is dedicated to open space and common areas, inspiring a sense of a close-knit, cottage community. No southwest Michigan lake home community would be complete without an in-ground private pool and clubhouse, including a full kitchen and changing areas. At the center of Harbor Club is a community park with a stone amphitheater and fire pit. Harbor Club South Haven invites you on a journey to your new life. Contact us now for more information and to schedule a private tour.